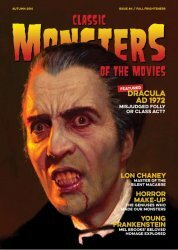 Direct to MyMovieMonsters.com from the United Kingdom: The fourth issue of Classic Monsters of the Movies magazine -- continuing the tradition of the great monster mags of yore! We ship same or next day so don't wait for the UK! Dracula AD 1972 -- it's one of the most despised movies in the whole Hammer catalog, but we think there's more to this groovy romp than meets the eye. Our in-depth article explores the making of one of cinema's unappreciated classics. Monkey monsters -- horror movies seem to have a particular fascination with ape-based horror. We look at some of the most popular monkey horror films, as well as some of this subgenre's more niche offerings. Lon Chaney -- the Man of a Thousand Faces brought us some of horror cinema's most powerful images. Our biography examines the on-screen and off-screen suffering that helped Chaney create his unforgettable monster designs. Young Frankenstein -- join us in celebrating Mel Brooks" loving homage to the Universal classics. Our retrospective covers on the production and legacy of this much-loved movie, now a horror legend in its own right. Magazine specification: 68 pages. Full color throughout. Packed with photos, posters, articles and info. Printed and finished to the highest standard on thick paper stock. Collectors Note: The publications produced by Stripey Media Ltd., including the "ultimate guides" that we also offer while supplies last, have set a new standard for quality. All photos are crisp, pages are colorful, and even the covers on the guides feature spot varnish to make cover elements pop! These are a must for any monster magazine collection. Want both Issue #4 and Issue #3? Use the handy "buy both" button below.